Incompetence in authority positions is actually much more common than we want to believe isn’t it? I think we all know, or have actually worked for, someone who clearly had no idea what they were doing. In fact, you’re probably seeing their face right now because engaging with them was so frustrating that it created indelible memories. The first is that regardless of occupation ambitious people get promoted to their level of incompetency. What I mean by this is that doing good work typically gets you promoted to greater levels of leadership. Ambitious people accept these promotions until they reach a position that they are incapable of performing in. When an organization is unwilling to invest in leadership development, or at least demote ineffective leaders back to their last level of success, they will always find themselves with leaders who are unable to motivate their teams… because they spend the majority of their time frustrating them. The most obvious example of this is The Office’s Michael Scott. When Dunder-Mifflin promoted their best paper salesman to the role of office manager, they moved him from his highest level of productivity to his lowest. What made it funny is that we all got to watch it without working there, and the show’s runaway popularity is the sign that we could all identify with it. If the first reason that incompetency finds it way to large stages is a tragic consequence of success, the second reason is a demonstration of the frightening reality that we are typically forced to hire specialists to do for us what we cannot do for ourselves. If I don’t possess a necessary skill, I not only have to hire someone to buttress my personal limitation, but I also have to place my faith in their character based solely on their reputation. This means that I have opened my doors not just to experts in the skill that I lack, but also to experts in fraud; experts in fraud are not easy to identify are they? The classic illustration of this is James Bond, a man who appears overnight, gains the confidence of high-level leaders, and then disappears overnight with their girlfriends and secrets. When we attempt to hasten results by immediately trusting friends of friends, failing to establish qualifying standards, or ignoring those standards in favor of charm, we virtually open up the front door and invite charlatans into the areas of our lives where we are the least prepared to deal with them. It’s very easy to get fooled by someone who doesn’t know what they’re doing, when you don’t know what you are doing. 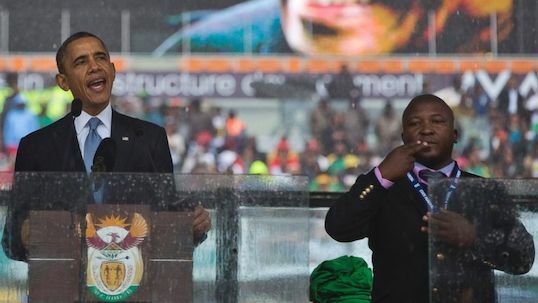 None of the people on the stage at Mandela’s ceremony could point out the faker because none of them knew sign language, and each of them believed that someone they trusted did. Since incompetence and chicanery get spotted regardless of why they happen, the question is whether they get spotted before or after they embarrass you in front of a global audience. It was the global audience who alerted the event organizers about the fraud that was being perpetrated on them, it was the global audience that asked for an accounting, and it is the global audience who lost respect for the leadership of the event. In the end we either take the time to do the hard work of development and the legwork of research, or we get taken advantage of in ways that hurts us and the people that we lead. …so long as you are just watching them and not working for, or getting worked over, by them. When are we going to say the President is incompetent.